Home #AustralianGp 2017 Valentino Rossi Valentino Rossi (Yamaha / 12th): "We do not give up"
Valentino Rossi (Yamaha / 12th): "We do not give up"
Valentino Rossi cannot be discouraged on Friday at the Australian GP after place 12. "We do not need much to the top, we can get better," he said. Movistar-Yamaha star Valentino Rossi has already experienced the most enjoyable first day of training in Australia, with 13th place in FP1 on Phillip Island and 12th place in FP2. Back to Aleix Espargaró: 0.752 seconds. There was also no hope that the Yamaha would work better on the favourite track of the nine-time world champion, and on a dry track and at usable temperatures, than in the continuous rain of Japan. Rossi: "In the end, it was not enough to stay in the top ten. The one who has been important, because at Phillip Island you never know what the weather brings the next day, you have to be prepared for everything. If it is wet in FP3 on Saturday morning, I have to go to qualifying 1 ... But we have worked a lot on the bike, and my feeling tells me the bike is not so bad here. In the end, we wanted to test the soft tire, but I did not feel good. Because up to that time, we had concentrated more on the media behind. However, it looks as if the softer one has a higher potential. He could even be an option for the 27-lap race. " "Overall we are not fantastic. But we still have some spare, I would like to show on Saturday. I do not have the desired balance, so I'm not fast enough in the fast corners. I do not have the necessary feeling in the front. we must improve that. " "Our test here in February with the 2017 motorcycle was one of the worst tests in my life, and my two Ducati years are included. I was very slow in February, the feeling for the bike was bad at the time, "Rossi summarized. "Today I felt much better than in February, although the position was not outstanding. With the medium tire I had a good pace, but then we wanted to compare the soft tire. But we will certainly have a better set-up for the soft tire tomorrow. The FP3 is very significant, I would absolutely like to go in the top ten and come directly to the Q2. We hope as a dry run and sun. " "We have no new parts or components, but we tell the Yamaha engineers what needs to be better on the bike. It is already working on the 2018 Yamaha, the Japanese technicians understand that we have to think of something. I do not know if we will get new components this year or only at the tests in February. We will not give up. If I can improve on Saturday here on some corners, we will continue forward. Our backlog is not huge. " 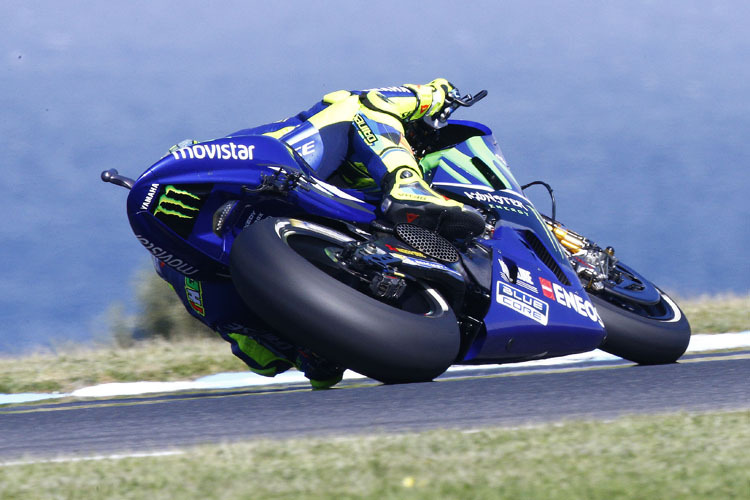 Valentino Rossi can not be discouraged on Friday at the Australian GP after place 12. "We do not need much to the top, we can get better," he said.